Ben Bernanke has done all he can, and it might not be enough. Federal Reserve Chairman Ben Bernanke said on Friday that the shadow banking system still posed a threat to financial stability, and funding markets might still not be able to cope with a major default…. "While the shadow banking sector is smaller today than before the crisis...regulators and the private sector need to address remaining vulnerabilities," Bernanke said at a banking conference sponsored by the Chicago Federal Reserve Bank…. Asked about the issue of too-big-to-fail banks, Bernanke said regulators should tell banks to hold more equity if they decide that current rules do not do enough, rather than impose an arbitrary limit on size. "Because that makes them safer, but also because it reduces or eliminates their funding advantage and gives them an incentive to reduce or simplify their firms," Bernanke said. Calls to cut the size of big banks, which are perceived to rely on taxpayer bailouts no matter how risky their business conduct, are on the rise in Washington, but Bernanke said current global capital rules needed to be put in place first. On the bright side, while their boss frets about shadow banks, his underlings are shrugging off the specter of inflation&apos;s waning shadow. “We have to defend our inflation target both on the upside and the downside,” Federal Reserve Bank of Philadelphia President Charles Plosser told reporters Thursday. 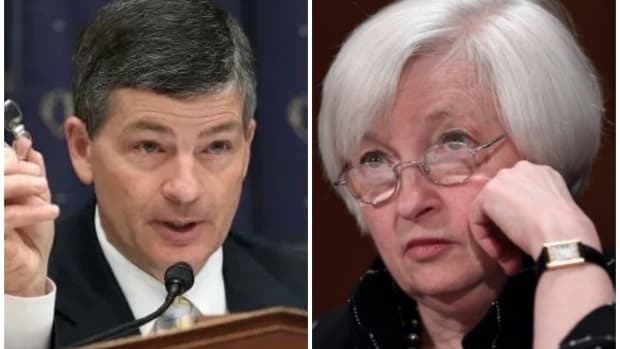 He said that for now, “I’m not concerned” about the current pace of inflation because inflation expectations continue to predict that price pressures will stick to something more consistent with the Fed’s objective, he said…. Mr. Plosser is part of the hawkish wing of central bank policy makers, and he has long opposed the Fed’s ongoing and open ended bond buying program. He said that the purchases offer “meager” benefits and don’t help the labor market the way many on the Fed would like to think. Indeed, he would like the Fed to consider tightening policy.